In the latest incarnation of this project – that little picture you see over on the right there, a bit up, I think Céline’s wearing hot pink, yeah, that’s the one – there are four people just like you. These four between them have 9 kids (and seven sacks and seven cats). Like you, they have jobs and mortgages and rent to pay. Like you, they trudge back home through the slushy indignity of a Wednesday evening wanting nothing more when they get home than to eat something warming, ball up in a small nest of blankets in a corner and tune out the world’s assault for a few hours. 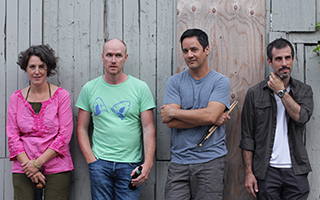 But for a few years, on that same Wednesday evening, these four people would gather their preferred instruments and head back out into said slush to meet in a basement or garage and summon the day’s last bilious dregs for an evening of music-making. For a few years they took themselves through this weekly exercise in penance for the other seven days spent labouring for someone else’s ends. Instruments would be set up, the first notes of a song struck, other instruments and voices joining reluctantly, heads bowed, no eye contact made, each a coiled spring in her/his own corner, sound made to be sure – but not always music. Yup, that was us for many a year. Trying to keep our tenuous grip on our creative outlet. Looking back on those Wednesday evenings, it seems they were conceived as some sort of perverse punishment. Yes, they broke up the week but at what cost? When you’re a 40 something aspiring to make music, you need time and insulation from your day to day life to make it happen otherwise it’s an exercise in self-flagellation. Then a few years back, we happened on the concept of “the retreat”. 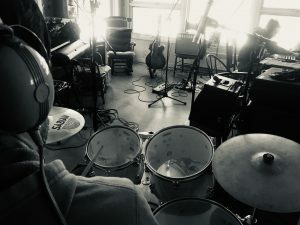 The basic idea is as follows: you find a friend willing to rent you a place in the country at a favourable price or loan it out in exchange for a few chores; you pack everything up: instruments, mics, stands, amps, preamps, laptops; and build a studio in a living room or outbuilding to make music for a weekend. The first one happened quite spontaneously one weekend at Céline’s parent’s place. As I recall, it was the weekend after a Friday show in Sherbrooke. We set up in a barn jamming solidly for two days and walked out of that thinking that we might just be on to something. Over the years, we’ve replicated this in locations all around the hinterland of the island of Montreal: Ste-Elie-de-Caxton, Richmond, La Conception, Mansonville, Saint-Casimir-de-Portneuf, Lac-a-la-Tortue and Potton. With the grant from CALQ, we refined the formula and turned it into a veritable discipline: every 3-months we’d get out of the city and focus on group songwriting. There were a few basic precepts we followed: bring every instrument you can fit into the car, bring a lot of beer and other consumables; cook all the meals beforehand (thanks Céline) so food prep doesn’t cut the flow; mic absolutely every instrument and set up a running session file with an input for each mic; set up a foot pedal to quickly trigger recording; jam more or less non-stop for hours; hit that foot pedal anytime something sounds innaresting; and when in doubt, apply liberal doses of beer (but save the other consumables for when the day is done). We literally have dozens of hours of recorded material from these retreats and lots of great ideas that have yet to see the light of day. All of this culminated in February 2017 with a month-long home-retreat in my basement studio as Céline and I used some of the grant money to take a month off of work and focus on intensive songwriting, but that story needs to be told in another post..
For now, we’d like to extend a big thanks to all of you who opened your houses to us over the last few years, this record owes a lot to your generority and the acoustics of your living rooms.